Even now, as an adult, I find it hard not to believe that Anne Shirley is a real girl. Anne and I first met in my early teens, I think, and we became kindred spirits right away. I did think she talked an awful lot, though. It was with a little trepidation that I visited the setting for the Anne books in Cavendish, PEI. Would my lovely imaginings of Marilla and Matthew's house be shattered? Would I be able to see the landscape with Anne's eyes? Would my understanding of Anne be enhanced or diminished? The home that originally stood on this site in which is now part of Prince Edward Island's National Park belonged to relatives of Lucy Maud Montgomery and LMM visited the home frequently. That home was replaced with this replica of Anne's home as described in the novels. In the above photo, Anne's bedroom is over the porch. An electric candle burns in the window - perhaps Anne is signalling to Diana that she has something important to say. The natural world provided much inspiration for LMM, who loved her native island with a lifelong passion. It was lovely to be there when the lilacs were blooming, just as they were on the first morning that Anne awoke in Green Gables and dreaded being sent away because she was not the boy the Cuthbert siblings had asked for. This gnarled tree with a few blossoms is perhaps a model for Anne's beloved cherry tree, the Snow Queen, that was destroyed by wind. I've not read the books for years but memories were triggered at every turn. Above is Anne's bedroom, less austere than her first glimpse of it. The white bed, the sprigged wallpaper, the little touches of plant and candle bear Anne's imprint. Hanging on the closet door is the dress that Matthew had Mrs. Lynde sew, complete with double puffed sleeves. "All I want is a dress with puffy sleeves." "It is ever so much easier to be good if your clothes are fashionable." The spare bedroom - perhaps one of Rachel Lynde's quilts is on the bed. "Below the garden a green field lush with clover sloped down to the hollow where the brook ran and where scores of white birches grew, upspringing airily out of an undergrowth suggestive of delightful possibilities in ferns and mosses and woodsy things generally." I visited the site with a friend named Ann, without an e; a lovely, kind soul who lives on PEI and encouraged me to take all the time I wanted. We wandered through the Haunted Woods and Lover's Lane. White birches, moss and ferns abound. Mosquitoes, too, and I don't recall reading anything about those pesky critters in the Anne books, do you? This washstand is in Matthew's room, which is downstairs, unlike the other bedrooms. You can see a shaving brush there on the corner. A dresser with beautiful dishes reminds me of the meals Anne helped prepare - usually with some calamity attached. Details extend to geraniums on the kitchen windowsill - perhaps this one is named Bonny, just as Anne named the first geranium she saw there. In the evening, Ann and I went to the Anne of Green Gables musical in Charlottetown. The season has barely begun and in fact, we saw it on a preview night. It was delightful. I laughed. I cried. Not everything was true to the novel, but that didn't really matter - the spirit of Anne was true. I left with my heart full of emotion. The visit to Green Gables and then the musical was a girlish dream come true. All quotations are by Lucy Maud Montgomery. Merci pour ce post, Laurie, je viens de faire une recherche sur Anne et j'ai appris plein de choses ! J'imagine que cette visite était très intéressante mais aussi très émouvante. I really enjoyed this post. Love the little details here and there, the house as well as the path into the woods. A really great place. Ahhh...perfection! Thank you for all the tickling of memory, the photos, and the descriptions. I do believe that Anne of Green Gables was enough autobiographical to give us the sense that Anne is a real person. She has always been very real to me as well. Don't know if I'll ever get there, but I'd still love to visit. Your post, with all the lovely photos, is the next best thing! Thank you! Lovely, lovely post! Thank you sharing this wonderful experience. What a quaint, beautiful setting! Oh what a wonder this post was! To visit this amazing sight is still high on my bucket list. Thank you for keeping the dream alive! I love Anne, too! What a wonderful trip. It looks beautiful, and delightful! Anne Shirley! The heroine of my childhood! What a lovely trip down memory lane, Lorrie. It's hard to believe I never read those books, as much of a reader as I was (no TV growing up). I'm glad your memories were not disappointed after visiting her house! That means someone was a great writer. What a lovely post and tour! The house and the path look beautiful! Thanks for sharing your visit! Enjoy your day and have a happy week ahead! Beautiful tour! I also met Anne as a teen and became kindred spirits with her. How lovely to see in your photos those places she so lavishly and lovingly describes in her books (hmm... I don't remember anything said about pesky mosquitos either ;o). Thank you so much for sharing the magic of your visit with us. Lorrie, What a great visit to a special place and a unique Anne with an e. Sylvia D.
What a wonderful post. Love seeing Anne's home through your camera. Thanks so much! Now I want to go there too. I have on my bucket list Beatrix Potter's home, but this is now on that imaginary list. What a really charming post! I love Anne and I "met" her when I was a teen myself... thank you for this post. I visited her "place" a long long time ago, this post tells me maybe it's time to go and visit again... oh I wish I have a copy of that movie right now as i would sit and watch it again... Thank you for this lovely post. Wonderful post and a delightful tour of Anne's place! I think I should go and read the book again ...!!!!! Happy Monday! Oh how magical to visit Green Gables! Isn't it a wonderful place to visit? I know I'd like to go back there and to the island in general. Now that I know some bloggers on PEI, I could do some visiting. How fun to see the stage production while there Lorrie, thanks for sharing your lovely post at Mosaic Monday. Thank you for sharing these amazing photos! I also adored the Anne books when I was a younger so a visit to Green Gables is definitely on my bucket list! I heard that a 2-hour remake of Anne of Green Gables is slated for release sometime in 2016! Thank you for sharing these with us; I have wanted to go visit PEI ever since reading the Anne books and LM Montgomery's beautiful descriptions of the island. I sometimes even now pick up one of the books just to have a quick "visit." What a great post! I almost want to read the books again!! Anne of Green Gables is one of my favorites and you have been so lucky to see PEI ! It is on my bucket list!! How very wonderful to experience the world of Anne! Beautiful photos. As a fellow Anne Shirley lover, this was beyond wonderful:) Thank you! I loved being able to take this tour with you! I named my daughter Miriam Anne (my husband had a hard time saying Marilla) because I loved the characters so much. Thank you for sharing so many beautiful details. Nice to see you again,Lorrie!! What a beautiful post and lovely photos! I love Anne, too.Prince Edward Island is one of the destinations for many Japanese fun of Anne. I still enjoy Anne. One of my English text books is "To Anne's World", which was published by Japanese TV broadcasting company. The story is fun, but long and difficult for my English skill.Although I try to read many times it I will need more time to finish it! Thank you for sharing. What a treat to visit a place that brings your childhood memories alive again. The joy of reading and the gift of travel are the great delights of life. And I am glad that you have shared your trip with us. Thanks for stopping by the Garden Spot, too. I feel quite embarrassed: I’ve never read Anne of Green Gables. Do you think it’s too late now or should I attempt to capture for myself all the splendidly romantic images you hint at here? I don’t really mind reading books for a younger audience, provided they are well written even a seriously mature lady like myself can derive much pleasure from them. Lorrie, I'm so glad you enjoyed Green Gables and the play in Charlottetown. A trip to the Island is not complete without seeing Anne, one way or another. Sounds like you've been having a wonderful visit; lobster rolls, you drove the bridge, Halifax and the Annapolis Valley, you've had a good taste! Too bad you don't have time to visit Pam and I in NB. Hope the cold has left you both and you are feeling better. However did I miss this post, Lorrie? But so lovely to see the pictures and read your of your experience being there! I must send a link of this to my daughter, a true fan from early days and like you, a believer that Anne must have been real. Thank you so much for this visual treat! Lorrie, how I envy you! I have always longed to visit PEI and Anne-with-an-E. But, no, I don't recall any mention of mosquitoes in the books! 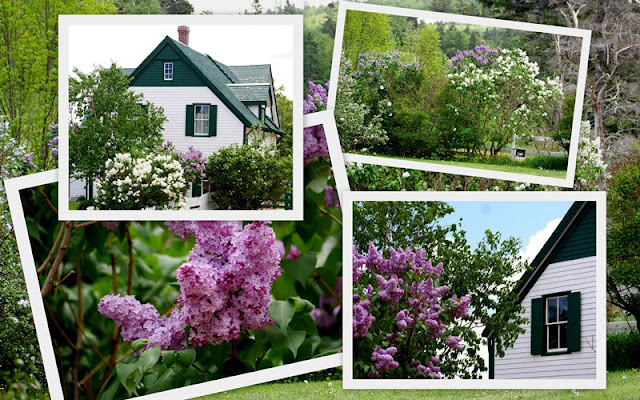 I think there are many of us who are just enchanted by the thought of visiting Anne's home on PEI. What a wonderful opportunity. I'm with Diane. I'm thinking I need to re-watch the DVDs also! They are so charming. Thank you for sharing these delightful photos with us! What fun Lorri. I remember watching the series with my daughter. We just loved it. Anne's character was cast perfectly along with the others. Loved Marrilla. look forward to read your next blog. !